Prominent & Leading Manufacturer from Ahmedabad, we offer wire drawing diamond die for gold. HK MALVI supplies Jewellery wire drawing dies under "real diamond dies" for drawing precious metals gold silver chain wire. 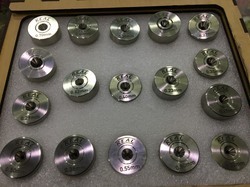 We have carbide dies, pcd diamond die for gold wire drawing, polycrystalline dies, steel diamond dies. The gold silver wire drawing die are available in guages and mm sizes, customer can let us know their size requirement upon request on the same.